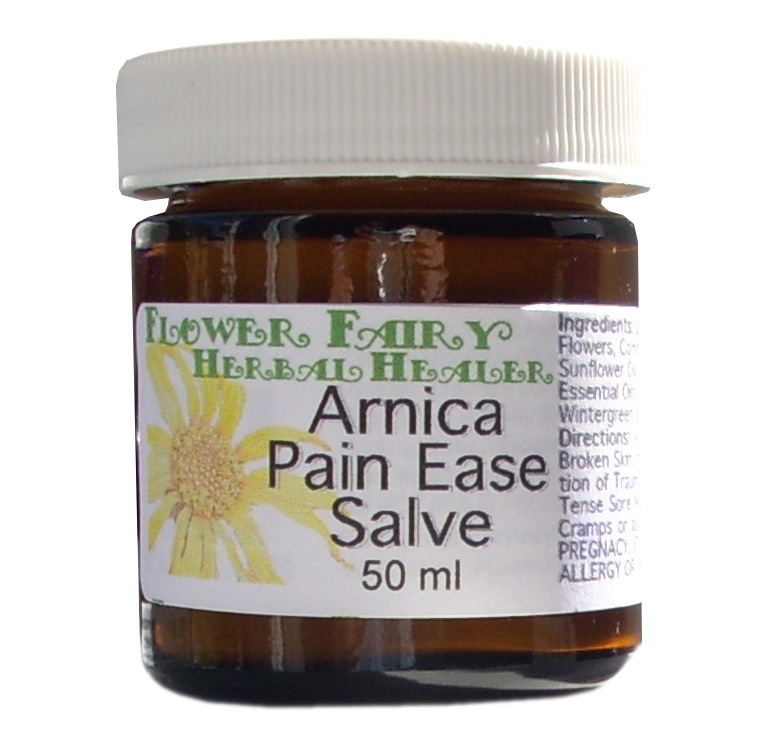 Description: This product is in a base of Arnica oil which is used by many practitioners to speed the healing of muscle-skeletal injuries. Comfrey, rich in minerals, was known as “bone knit”, has been traditionally used for skin rejuvenation, scars, breaks, injured bones, sprains, mild burns & rough skin. Peppermint & rosemary oil may relax spasms, ease discomfort of stiff, sore inflamed muscle, sprains, strains. It's cooling effect can help reduce warm conditions. Wintergreen has a sweet, mint-like scent. Camphor & wintergreen are commonly used in muscle and joint ointments for pain relief, gout & respiratory products, too. It contains natural salicylic acid, a pain & inflammation reliever found in willow bark & Aspirin. Eucalyptus & rosemary oil for joint pain, muscle aches, headaches & the swelling that may accompany arthritis, rheumatism & injuries. It has anti-fungal, anti-bacterial & anti-viral properties & is used topically when diluted for coughs & colds. These oils have a stimulating effect, which may help improve circulation, therefore reducing pain & swelling of arthritis, muscles, spasms, injuries & sprains. As circulation improves, less toxins settle in joints/tissues, which may aid in reduction of inflammation/ pain. Rosemary increases cellular metabolism, circulation and lymph drainage. Directions: Both the oil or salve is for external topical use only. Use for any non-open wounds. Great to use as a therapeutic, extra-healing massage oil on tense, sore, aching muscles. Use on bruises, sprains & arthritis, tense neck muscles or on inflammation or sore joints. May speed recovery after exercise or trauma. A mildly warming liniment to use on non-broken skin, to help accelerate healing, ease inflammation of trauma, sprains, bruises, breaks, arthritis, gout, tense sore muscles. Great for after exercise, for menstrual cramps and associated low-back pain or as a chest rub for colds. Great to help relieve those tense neck muscles that can lead to stress headaches or to use on tired or achy sore feet, or stiff sore low backs Please do not use on open or bleeding skin/external use only, Avoid eyes! Ingredients: Local, handpicked, organic, Arnica Montana flowers, Comfrey Root & Leaf, Extra Virgin Olive Oil, Sunflower Oil, Natural Vitamin E & Jojoba Oil & 100% certified organic, natural, fair-trade, pure & natural essential oil of Eucalyptus, Peppermint, Rosemary, Wintergreen, Camphor and the salves have local bees wax for thickening. Cautions: Avoid peppermint essential oil during pregnancy or nursing, due to the fact it can stop milk flow & bring on menstrual flow. These essential oils may cause skin sensitivity, in those individuals with sensitive skin. Do not use products like this which contain peppermint if you have high blood pressure. Caution: Avoid rosemary essential oil if you are an individual with seizure disorers. Avoid with salicylic allergy. Avoid eyes. Avoid using on delicate fabrics like silks or satin due to it’s essential oil content.